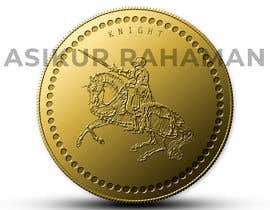 I have a company that produces souvenir commemorative coins, all with a British theme. War commemoratives, famous Britons, Historical events etc.. I am looking for artwork that would be printed on to one side of a lot of the coins. It would also be used as the main company logo for business cards, websites etc. 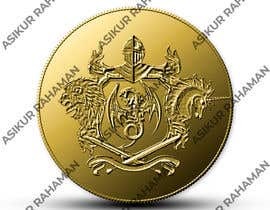 The coins all have a British theme and I would like something along the lines of a classic crest or coat of arms. 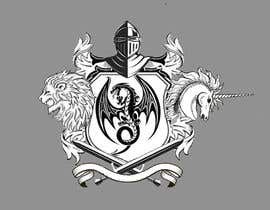 I would like a lion and a unicorn to be incorporated, (perhaps fighting a dragon?!) and maybe a castle, shield/sword, Union Jack, WW1, WW2 War Hero, Knight etc. Also the Latin from the British coat of arms would be a great addition (Dieu et mon droit). The detail can be reproduced on the coins very well and they are embossed so 'layered' images are fine. I would like the company name to be wrapped around the edge of the design. Obviously the coins are round so a design which doesnt leave too much empty space would be ideal.